Now on the App Store: The Graveyard for iPhone and iPod touch. Only 1.99 US Dollars. A free Lite version will be available as soon as Apple approves it (release has been stalled a bit because they disapproved of your use of the word “Trial” and the reference to the full version in the description of the “Lite” one). The Graveyard offers a player the opportunity to imagine themselves in a certain situation. It’s not a game in the sense that there is a way to win or lose or a puzzle to solve, or even a story to uncover. But the interaction does immerse you in a virtual world filled with narrative, an equally powerful feature of the medium of videogames. The iPhone version of The Graveyard is the same as the PC version. Only a few elements have been removed or simplified to allow it to run on the iPhone hardware. But the fact that you hold the game in your hand and touch it with your finger, adds to the sensation of fragility and preciousness. The Graveyard was originally made for Mac OSX and Windows with Unity (2 years ago already). Since there is an iPhone version of Unity, we figured we’d just port the game. It wasn’t as easy as expected. The iPhone hardware is a lot less powerful than a PC, so we had to tweak the graphics a bit (no post-processing, no real-time overlays, no animated trees, no birds, and a vertical display area to reduce the visible part of the environment). Another problem was the lack of a usable format for sound compression which lead to the download being larger than the PC version (isn’t it ironic that an MP3 player is so bad at handling sounds?). Still, if you ask us, The Graveyard is one of the best looking and sounding games on the iPhone. Hope you enjoy it! Can we expect a version of Vanitas for computer? We’re thinking about it. It couldn’t be the same, though, since Vanitas uses tilting and multi-touch on the iPhone. I don’t think the current generation of cell phones would be able to run The Path. I also doubt if it would work as well, emotionally, on such a casual device with such a small screen. There seems to be a misunderstanding here. I did buy The Path, on USB as it happens. I wasn’t complaining about prices at all. All I was trying to do with my original post was highlight how most Android apps aren’t worth paying for, but I would nevertheless buy any app Tale of Tales makes for the platform. Oops. I did indeed misunderstand your first post. I thought you meant that you would only buy our work if it would be available for the Android platform. My mistake. I apologize. We’re sadly more used to dealing with people complaining about the price of software than people praising the quality of it. So what’s the whole story line of the graveyard?I downloaded the lite version but I don’t really get it. The Trial/Lite version is almost the same as the Full version. The only additional element is the possible death of the protagonist. There is no story line as such. Except for the “ultimate story line” of life ending. Think of The Graveyard as a painting, as a poem. 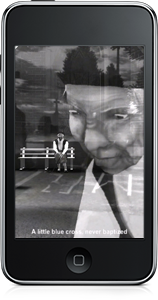 The idea is to offer the player an environment where they can contemplate life, ageing and death. If you’d like to find out about its creation, have a look at the postmortem. Next Next post: The Game Developers Conference starts today!